of discussion and division. I shall come to the album’s qualities/negativities – and the people who are all having their say – but, in 1997, there was a huge amount of attention on Oasis. In the Britpop battle with Blur: advantage had switched to the Manchester band – Oasis’ What’s the Story (Morning Glory?) toppling The Great Escape in 1995 – and they were, in their own words, immortal gods. That braggadocio and confidence was typically cocky but deserved. Having produced two of the 1990s’ best albums: many would forgive them for thinking they were indestructible. The band seemed to articulate a sense of freedom, togetherness and revelation – songs that connected with people and articulated a sense of hope. Oasis’ first two albums – their debut, Definitely Maybe, certainty – was chocked full of anthems and era-defining songs. A working-class band from Manchester able to bring the people together – it sparked the fire of Britpop but, more importantly, introduced the world to one of the greatest bands of the past couple of generations. Before providing my thoughts and why Be Here Now’s release was a historic milestone - a look back at the record’s release and themes. Oasis’ management, Ignition, knowing how well-received their previous albums had been - were concerned about the level of attention Be Here Now might receive – wanting the media to tone things down and keep the promotion to a minimum. Almost stealth-like: the company wanted minimal airplay and a calmer sense of proportion. Naturally, this backfired spectacularly and, maybe consciously, created hype and speculation. Sensing something monumental was about to arrive; radio stations, fans and publications were heavy with rumour and fascination. This sense of what-if created more momentum and attention than if the band had promoted the album in conventional ways. The album sold 424,000 copies on the first day of release alone – becoming the fastest-selling album in British chart history. The album’s creation was marred by drug abuse and arguments and, as Noel Gallagher revealed to Kirsty Young during his Desert Island Discs appearance (2015) – they had recorded three albums in as many years and all of it was recorded under the influence (Liam and Noel the biggest partakers). Typical of the band: the previous year was filled with over-confident proclamations and successes. Noel Gallagher was invited to 10 Downing Street – he revealed, in the same Desert Island Disc interview, it helped usher Labour into government – and the celebrity status the band were afforded, as you’d expect, went to their head. That belief that they were God-like figures, coupled with drug use, was never going to result in a modest and focused album. So proved to be the case because, the winter before its release, Noel Gallagher revealed he was suffering writer’s block. 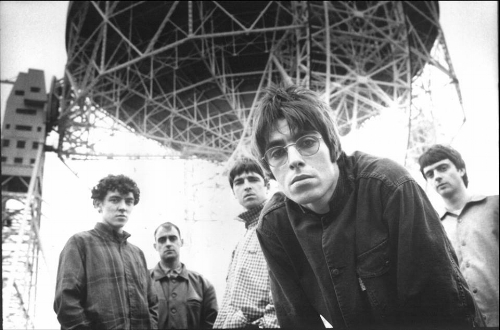 Most of the songs on Be Here Now, lyrics at least, were taken from before the time Oasis got a record deal. Gallagher was idling and thinking; looking for something that could match the magic of What’s the Story (Morning Glory?). Joining album-producer Owen Morris; the two laid down eight-track demos on a TASCAM recorder – drum machine and keyboards for the most part. Morris, looking back at those demos (recorded in Mustique) realised he had made a mistake. Rather than use the demos – Noel’s bass, guitar and percussion notes – they went with the album sessions. The album, as a result, was bloated and overblown but, as explained, I shall come to that later. Having performed two concerts at Knebworth House in August 1996; there was a creative and confidence high that got to them in a good way. Of course, with that much love behind them, they would feel pumped and eager to release new material. Perhaps the pressure and demand meant Be Here Now was rushed. Exploits away from the studio were impacting the strength of Oasis’ bond. Liam was going further off the rails and, aside from taking jabs at Noel, was partying and getting into scrapes. There was tension and the belief Liam would leave the band – I think Noel wanted him out as he was bringing the wrong kind of attention the way of Oasis. There was a consensus that, if the band has recorded the album in summer 1996 – at the villa in Mustique when the songs were laid down in rough form – then that would have been a happier and more focused environment. Maybe wait a year and let the pressure settle but, like The Beatles in the 1960s; that enormous need for something new forced them into a bad decision. Many saw those villa recordings and the pre-Knebworth House period as the last hurray for the band. Those epochal concerts were career-high moments that started a decline. The anthem nature of their previous two albums was all in place. Whereas records like Definitely Maybe were energised; there was tightness: songs not really going on too long but able to convey so much in that time. Be Here Now was Elvis in his final days: bloated, troubled and lacking any control. The cocaine-fuelled – perhaps literally and sonically – meant tracks ran on and on without much reason. Some cuts repeated lines inanely whilst endless guitar solos and layers gave it a full-on and suffocating feel. D’You Know What I Mean and All Around the World drag and bore; My Big Mouth employs over thirty layers of guitars. Lots of top-end frequency tones and experimentations – a little more freewheelin’ and indulgent than previous albums. The compelling sing-along that defined earlier breakthroughs like Live Forever was replaced with sub-pub-anthem-chorusing that seemed to indicate there were few in the ranks that had the courage to question Noel. Maybe there was too much rush, tensions and distraction. Whatever the truth from within camp: Be Here Now was released to the world on 21st August, 1997 and was, by all accounts, a phenomenon. The album itself can be split between those diehard fans and those experiencing the band for the first time. From my perspective; Be Here Now is a confident record but one that fails to capture the same quality and focus as their first two. The band was keen to try something new – in terms of sounds – and keep that lyrical simplicity intact. They did this but, fuelled by pressure and growing fame, their sense of economy abandoned them. Noel Gallagher freely admits there should have been judicious edits and greater self-awareness. Maybe, cropping a few of the longer songs would have been beneficial – some songs merely repeat guitar lines and aimlessly find Liam repeating the same codas/words with zero resonance. The band had shown, on songs like Champagne Supernova, they could do something long and explorative without losing interest. That song ends What’s the Story (Morning Glory?) and is a classic Oasis anthem. Songs like that, Wonderwall and Live Forever should have acted as guidelines in regards quality, running time and themes. Circumstances had changed so it was understandable Noel Gallagher would not be at the same standard he was on the previous two records. He had, as he confessed, said everything he wanted and was going through a dry-spell – making things up when formulating the songs for Be Here Now. I love Stand By Me and, whilst it is a long song, it has an effective and memorable chorus that seems to reflect the finest points of What’s the Story (Morning Glory?). All Around the World has a big chorus but suffers from excess and over-long running-time. There are a few fillers but, take it on its own merits, and it is a classic three-star album: not a disaster but hardly a modern-classic. Compare it to Oasis albums to that point and it can only be viewed as a failure/missed opportunity. Unfortunately, given the hype and expectations of the time, critics listened to it with blinkers and rose-tinted glasses. The same way they had done two years previous with Blur’s The Great Escape: there was the assumption, without listening, the album would be as good as their previous best. The mass positive reviews were generated as a reaction to the huge speculation and build-up Be Here Now received. When the festival has died down, and there was relative quiet, more realistic and considered reviews were generated. Some remained positive others retracted previous praise and provided a more constructive criticism. The change in cultural dialectic between Oasis’ Britpop-period and their distancing from the common man was lost in translation. Ego and enormous self-belief had stripped away the qualities that made the band such heroes. “While critics often cite the chorus as an exemplar of the vacuity of the album, they tend to ignore the different rendering of it the second time through, which reveals its true purpose (the "All my people right here right now/D'you know what I mean?/Yeah, yeah" of the first reading goes from opaque to transparent when the "D'you" is replaced with a "they" for the second run through). The final lines achieve the near miracle of dragging some sort of unifying and relatable lessons from the personal pain of the past, the song turning an image that may in itself be an echo of that abuse when exhorting listeners to "Get up off the floor and believe in life/No-one's ever gonna ever ask you twice". To be able to take something universal and uplifting from that kind of experience is an achievement deserving of the highest respect”. It is worth reading the remainder of the piece as it does give a new spin – that seems to contradict and challenge the retrospective reassessment the album has received. It was amazing seeing the news the day the album came out. People excitedly packed into shops and chatting in queues. There was a community and spirit in the air we have not really felt since. Yes, there have been big albums that saw huge queues – nothing gathered the same momentum and attention as Be Here Now. It was Oasis’ Beatles-moment – the retail equivalent of Knebworth, if you will.